A recent survey of order picking professionals and management revealed that one of the top carton flow system priorities for them was the ability to utilize pallet rack as the "host" rather than a specialized picking rack. 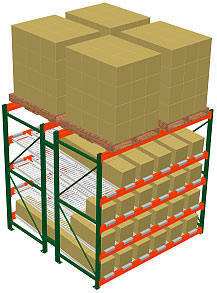 Pallet racks are found in nearly every warehouse, shipping or receiving department, shop floor, stockroom, and factory. People know how to configure, assemble, move and use them. The ability to store fast-moving each-pick and carton-pick items below with bulk, palletized storage above is very useful. It puts lots of product in a pretty small footprint. For instance, an 8' wide rack double-deep, 8' deep with four shelves of carton flow can present 24 gravity-flow pick faces. Pallet racks that utilize carton flow tracks are an excellent way to mix slow and fast-moving items in the same storage footprint. With overhead pallet storage, bulk quantities are easily transferred to active operation later. Most systems utilize Low Profile Span Track, which installs between existing pallet rack beams. Generally chosen where vertical space is limited or if above-pallet storage requires fork trucks in the aisles. Placed along a line of conveyors, or used with cart-based picking, flow racks provide a solid wall of pick faces operators can quickly access to service incoming orders. Gravity flow modules work best for multiple-item orders, when average supply holding time is minimal, and when item weight is important. First-in, first-out (FIFO) storage gives you automatic inventory rotation. Whether you need a bay or two of flow storage or a long row of gravity-driven pick faces with pallet storage above, utilizing rack-mounted flow storage gives you the flexibility to change and reconfigure as needed—add, move, or remove flow shelves when you want, all within your pallet rack bays. Flow storage increases picking speed and efficiency because it reduces aisles and walking—pickers spend more time picking orders, less time walking to bins. You should look at our selection of standard sizes to get an idea of the size, cost, and weights of some common carton flow rack configurations. We can create different sizes and configurations to fit your exact application. Call or submit a carton flow inquiry for more assistance.